Puddles belong outside the tent. Tent Sure™ is a high performance, water based urethane formula designed to re-coat worn areas on waterproof coated synthetic fabrics. 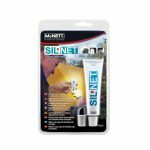 Tent Sure dries to a clear, flexible, long lasting film with a nearly invisible, non-gloss finish. Ideal for tent floors and flys, bivy sacks, rainwear, clothing, fabric accessories and hundreds of items using synthetic fabrics. Waterproofs up to 85 sq. 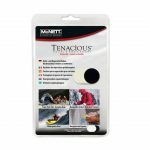 m.
Use Tent Sure to waterproof tent floors, rain flies, bivy sacks, rainwear and other equipment, and recoat worn, peeling, high-traffic areas so your tent will last longer. 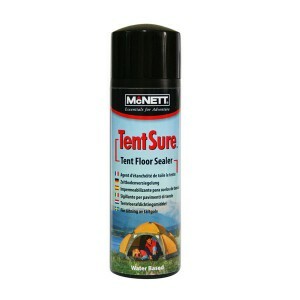 Tent Sure is part of a comprehensive line of Care and Repair products from McNett®. 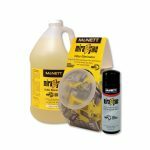 With McNett®, anyone can be a master of equipment repair. 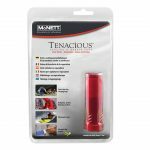 Tent Sure is part of the McNett GEAR AID™ product range. Clean and dry all surfaces. Remove old sealant with stiff brush and isopropyl alcohol. Shake well before use. Remove inner foil. Pour small amount of Tent Sure into plastic container. Apply a thin film onto fabric with foam brush. Apply to coated side of fabric (or inside of item). For best results use an even, sweeping motion to avoid puddles or over-application. 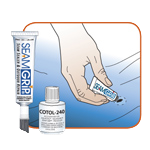 Some high-wear areas like tent floors may need two applications. NOTE: Two thin applications are more effective than one thick application. LET TENTSURE DRY FULLY for 24 hours at room temperature before use. 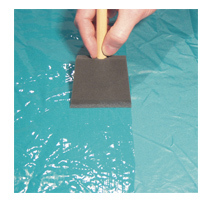 Keep treated fabric surfaces separated while drying. 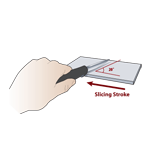 Test for dryness before use or folding. CLEAN-UP AND STORAGE: Wash brush or squeegee with soap and warm water immediately after use; stiff bristles may be loosened with lacquer thinner. Store in a cool, dry place. Tent Sure is freeze/thaw stable and washable/dry-cleanable.